One of the seven cooperative principles is economic participation. As a member of the cooperative, you have the benefit of the return of patronage capital, or profit. 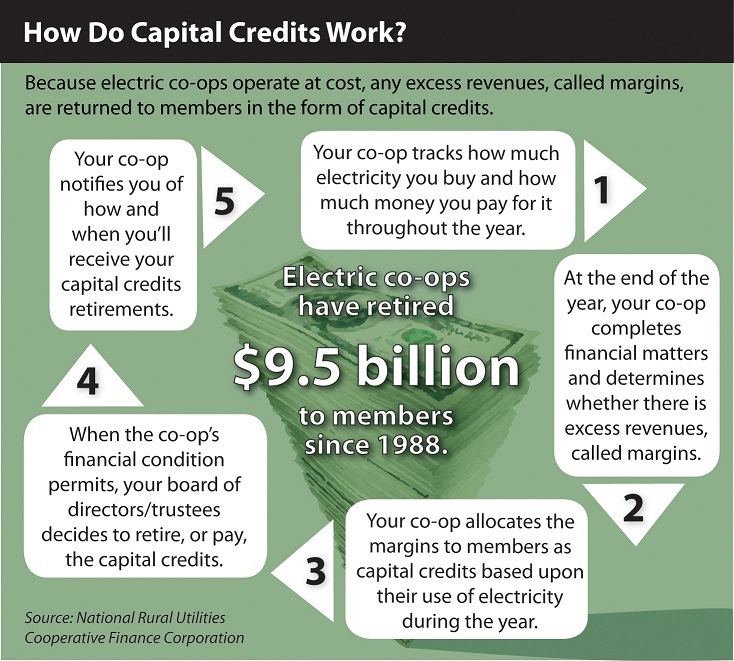 Capital credits reflect your ownership in the cooperative. Your cooperative has returned just under 8 million dollars in patronage capital checks to its members throughout the years. As you pay your energy, we utilize the revenue to grow, operate, and maintain a safe and reliable system. Any money that is earned over and above these costs of doing business is called margins. Your portion of allocated margins is then returned to you in the form of capital credits. Every member gets a "piece of the pie." See below for more information on how the capital credit process works and we may be looking for you! The JREC board has reviewed the financials for 2018 and determined how to best retire capital credits. In 2018, the board approved retiring 100 percent of any capital credits allocated in 1988 and 2 percent of all capital credits allocated in the years 1989-2017. The total capital credit retirement for 2018 is over $416,000. These capital credits were applied to energy bills mailed out in October 2018. Inactive members who have a retirement of $10 or greater will be mailed a check. If you move off JREC service lines, please be sure to contact our office with your new address so we can continue to send capital credit retirements you are eligible to receive in the future. Jump River Electric Cooperative has several former members who have not cashed their capital credit checks that were paid out in 2015 and are listed here: Name List. Please contact us only if you know the current address of someone on this list. You can reach us at 715-532-5524 or email us at jrec@jrec.com. In cases where the person is deceased, please call us if you know the contact information for a relative or benefactor who may have rightful claim to the cap-ital credits. Any unclaimed checks will revert to the Wisconsin Federated Youth Foundation, Inc. The Foundation is a charitable tax-exempt trust established by the Wisconsin Electric Cooperative Association for educational purposes. NOTICE OF FORFEITURE OF FUNDS HELD BY JREC, UNLESS CLAIMED BY OWNER. Pursuant to the Wisconsin Statutes Section 185.03 (10), you are hereby notified that Jump River Electric Cooperative Inc., of Ladysmith, WI 54848, has in its possession unclaimed funds that may belong to you. You can claim these funds by contacting the Cooperative and furnishing proof of your legal interest in such funds on or before September 6, 2018. You are further notified that unless you do claim such funds and provide satisfactory evidence of your right to receive the same by September 6, 2018, these funds will automatically be forfeited and transferred to the Wisconsin Federated Youth Foundation for educational and charitable purposes. The list of names can be found here: Name List.